With Shimano’s somewhat new S-Phyre line comes the addition of two new glasses: the Shimano S-Phyre R and S-Phyre X. For these new glasses, Shimano has collaborated with LottoNL-Jumbo riders Steven Kruijswijk, George Bennett, Robert Gesink, and Primoz Roglic. Feedback from World Tour racers means these glasses come with some well-thought-out attributes. The lenses are larger for better visibility and protection, their form-fitting design adds comfort while reducing airflow to the eyes, and the anti-scratch lenses come in darker tint options for better visibility in bright conditions. The S-Phyre R is the lighter pair at just 25.6g. It boasts a wide one-piece lens and a black rimless frame for added comfort. With a non-slip temple and swappable nose pads, these glasses are as comfortable as they are practical. You may find yourself forgetting they are perched atop your nose as you ride. The S-Phyre X uses the same lens design but with a top half-frame to hold the lens in place and a detachable lower frame offers protection to more pronounced cheeks as well as the lenses themselves. The S-Phyre X is available in a black or metallic blue frame. The new lenses are perhaps the most exciting feature of these new glasses. Both frame models come with your choice of a photochromic PH Dark Grey-Red Lens or Optimal Polarized Red MLC Lens. The photochromic lens quickly transitions from 13%-62% light entry in only 8 seconds to give you adaptive protection in sunny to partly cloudy conditions. The polarized lens has a fixed 16% and is best for very bright conditions. The 80% polarization reduces glare and makes LCD screens, car glass, and water in the road more visible. Regardless of which lens you choose, you will also receive an alternative Cloud Mirror Lens for low light conditions. It lets 85% of light through, filtering out blue light from red/yellow light which increases color contrast to improve vision in the dark. All three lenses are high-impact, anti-scratch, and have uv400 protection. Both sides of the lenses have hydrophobic coatings to reduce water, dirt, and dust buildup, leading to a more natural view of the road. 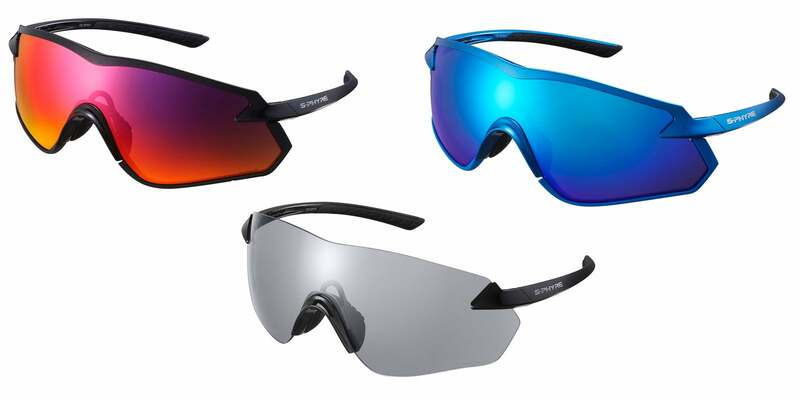 Hat’s off to Shimano for heeding thoughtful rider feedback and creating two great glasses to add to the S-Phyre line. The Shimano S-Phyre R and S-Phyre X will be available in select stores sometime this April.